Here at the Creeky Cupboard, located in beautiful, historic, downtown Sutter Creek, our goal is to provide you with most-excellent customer service, quality products, and great prices. We specialize in home decor, women’s accessories, greeting cards, gifts, children’s items and lots more. Whether you’re shopping for yourself or a gift for a special someone, we have a wealth of choices. While viewing our Creeky Cupboard website, relax with a cup of tea or coffee, and enjoy viewing our gift gallery, virtual tour, sign up for our newsletter, find us in Sutter Creek. Take a beautiful walk, drive, or flight that will bring you to our quaint town of Sutter Creek. We look forward to your visit! Jim and Becky Olvera have lived in Sutter Creek for 19 years. Becky recently retired, after 20 years, from Lodi Memorial Hospital. She was the Nutrition and Food Services Director. Jim retired last December from United Rotary Brush, where he was a Sales Manager for 38 years. Says Becky, “Owning the Creeky Cupboard is our dream come true. Most people that retire want to travel. We are on vacation in Sutter Creek. We just happen to have all our things with us! “We are from Sacramento and escape the city by coming to sweet little B&B in Sutter Creek. We always make time to visit Creeky Cupboard! I have found wonderful gift items for friends and also decor for our home. 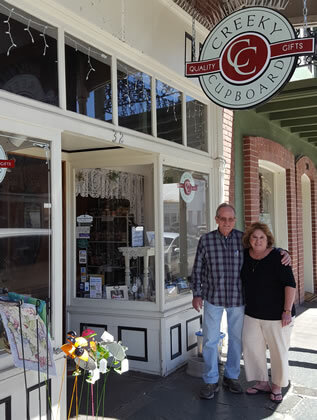 This little shop is a must for anyone visiting Sutter Creek!” – Steve & Anne W.
Sutter Creek, the jewel of Amador County & the Gold Country, is steeped in history being born of the California Gold Rush and nurtured by the deep rock gold mines of the 19th & 20th centuries. Sutter Creek is ideally situated in the heart of the Sierra Foothill Wine Country and is Amador County’s most walkable town with B&Bs, restaurants, and shops along the main street. It is the perfect hub to explore the Sierra Foothill Wine regions including Amador’s own Shenandoah Valley, El Dorado County’s Fairplay region and Calaveras County’s wine region.